Thank you to all who voted in last month’s photo of the month competition! 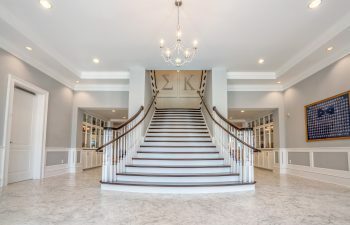 This month’s winner is a beautiful grand staircase that was designed and installed for the Sigma Kappa sorority at the University of Florida. This staircase was sold by Don Wagner on our national team and was constructed and installed in partnership with D.E. Scorpio. In order to bring together a modern yet traditional look for this flared staircase, our team utilized wooden balusters, handrails, and treads that complimented the house’s marble floors.